Absinthe was finally released for the Windows operating system in the form of Absinthe v0.2. This means Windows users can finally Jailbreak their iPhone 4S from a graphical user interface, unlike this mornings CLI Jailbreak method. Thus, without further a due, in the how to guide from iJailbreak.com you will learn how to Jailbreak your iPhone 4S running the the iOS 5.0 firmware and both versions of the iOS 5.0.1 firmwares (9A405 and 9A406) using Absinthe v0.2 on Windows. Note: If you are looking to Jailbreak your iPad 2 with Absinthe v0.2 on Windows please click here. Perquisites: The very first thing you need to do before starting this how to is make sure your iPhone 4S is backed up. As the Absinthe Jailbreaking tool was just released, there is a good chance that you may experience an error Jailbreaking it. Thus, it is always a good idea to make sure all your content on your iPhone 4S is backed up. Additionally, if you iPhone 4S has a passcode lock you must disable it, and furthermore you will need to disable any current VPN’s setup on your iPhone 4S. Step 1: The first thing you will need to do is download the latest version of the Absinthe Jailbreaking tool from the iJailbreak Downloads Section or from one of the direct download links below. It is always recommend that you check the iJailbreak Download Section, however, to ensure that you are downloading the latest version (we do not always update these guides with the up-to-date versions). 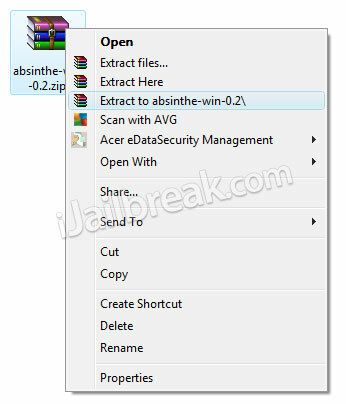 Step 2: Once you have downloaded Absinthe v0.2 you will need to extract it to your desktop. 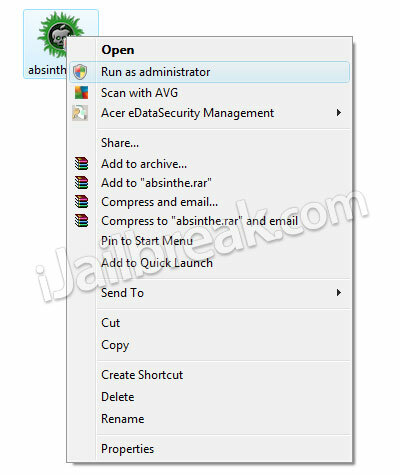 Step 3: Next you will need to right click on the absinthe.exe file and then click the Run in administrator option. Step 4: With Absinthe up and running you will need to plug your iPhone 4S into your computer (if you have not done this already). Upon doing this Absinthe should recognize your iPhone 4S, and once this happens, you will need to click the Jailbreak button in the middle-right side of the screen. Step 5: Once your iPhone 4S reboots you can slide-to-unlock it and then on your SpringBoard (homescreen) you should notice a new Absinthe icon. Tap this Absinthe icon now, the official GreenPois0n website should appear for an instant, and then your iPhone 4S will reboot. Upon being rebooted you should notice that Cydia takes the place of the prior Absinthe icon. Congratulations! You have just Jailbroken your iPhone 4S Untethered running the iOS 5.0 or iOS 5.0.1 firmware with Absinthe for Windows. The Absinthe Windows Jailbreaking tool is new, and thus most likely there is going to be errors people encounter. iJailbreak.com has done its best to reference the most common errors people are experiencing and additionally provide solutions for them. Tip #2: If all else fails, try restoring your iPhone 4S (if you have not already) to factory settings, restart your computer and switch USB ports. works like a charm!! no problems at all, no restore wAs NESECERY FOR ME…thank you very much Dream-Team defintly donating for the cuase!! TNX!! very mucH! i’ll use your jailbreak until the last ipad version from the future… your great! you and the team,. Did the earlier process through command prompt to jailbreak the phone. Using the GUI it says I am already jailbroken untethered. I have the brown cydia icon, but I cannot open it – doesn’t work. How can I delete and start over, or any idea how to get Cydia to start? restore from apple and jailbreak with absinthe clean. Its been stucking at the last step “ABSINTHE is now setting things up, please stand-by…” for 30minutes. Is it that long or something happened? Tys0702: I have the same problem!! :(( now I am trying to rejailbreak it again. Absinthe won’t read that my iphone 4s is connected? Please help..
Absinthe kept crashing on my Windows 7 PC. Didn’t matter if I ran as administrator, or in Windows XP mode. Tried three Win 7 PCs, two of which were 64 bit, one was 32. Absinthe crashed every time right after the iPhone rebooted. SO then I ran Absinthe on an old Windows XP PC, and it worked first time. Jailbroken! I have a problem… absinthe is now setting things up, please stand-by? Same issue on absinthe stand-by screen!! !…45 minutes no luck!…any1 went through the screen problem!? This jailbreak worked fine on my 4S on 5.0.1, but the phone is still locked to Orange. I thought the phone should also now be unlocked for use with SIM cards from any network/carrier (as long as I stay on 5.0.1)? Mine stays at “Beginning jailbreak, this may take a while… ” and nothing happens . What can I do? 8) Finally Absinthe icon disappear and now Cydia apears! Guys, recently i did my ipad2 succesfull, now i did my iphone 4s. no problemo. Again, make sure you reset/default the device. **ATTENTION** for people that are stuck on the “ABSINTHE is now setting things up, please stand-by…” Here is my fix DOES NOT require a reset to factory, backup, or VPN on/off. 7. ABSINTHE app should work as it is suppose to and will automatically reboot iphone and the Cydia icon will take its place. Worked on Windows 7 x64 for Iphone 4S if this doesnt work please reply, if it works on a differnt platform please reply and let others know. The same thing happened with me . make sure you dont have any virus-protecting things running to prevent the program to infect your computer as it jailbreaks . you can turn them back off when the jailbreak is done . Keeps saying the “attatched device is not supported” on Windows version with my iPhone 4s 5.0.1 (9A405) Verizon. Help? This is my first jailbreak, so I have no idea what to do! i tried everything else on the web and nothing worked until i read Josh Stein’s post. It worked flawlessly, thank you Josh. I am having the same problem. I have restored 3 times, but after each, a non working Cyndia is there. I’ve started up the Absinthe V0.2 Jailbreak, but that tells me that the device is already Jailbroken. Didn’t work for me on OSX. Hey all I need your help. I downloaded a lot of apps and tweaks through cydia and I found that I’m not able to open the Wi-Fi app in settings. Later that day, my phone crashes and gets stuck at the boot logo. I restored my phone, and only reinstalled certain apps and tweaks and the same problem happened forcing me to restore my phone. i need the phpne back in 4 hours help asap !!! Yes, tether refers to the USB cord. Being foolish has nothing to do with it not everyone is familiar with the terms. You, my good man, are a GOD! THANK YOUUUUUU!!!!!! Hi all… Jailbroke my 4s ver 5.01 no problem… but its still locked to AT and T and i need touse another sim… what do i do next? keeps on crashing after my Iphone reboots ..
Am I the only one that this won’t work for? I have Restore my iPad probably 30 times to factory settings with 5.0.1. Tried VPN and all other work arounds listed below. It still keeps getting stuck on absinthe is now setting things up…. An then it just sits there and doesn’t do anything. I have tried everything. Different computers, rebooting, deleting absinthe and re-installing, any ideas? I have jailbreaked my ip4S now my apps freezes evrytime i try to open. I tried to restore back to manufacture setting but itune doesnt allow it. Help plz…. Any solution? How do i get out of dis jailbreak???? Dude, you are a GOD! you have any idea how many days i spent to fix this stupid VPN issue???????? THANKS MUCH!! why the attached is not supported? ?I already click the run administrator and plug my iphone 4 to computer…. Do you have any Idea when will the unlock tool available? Thank alot Josh.. Its works for iPad2 aswell..
mine keeps failing when it should be going good its right after it reboots the absinthe keeps automatically closing??? I see all those successful stories about using ABSINTHE and I feel really sad, ’cause it does not work for me. I have a iphone4 5.0.1 (9A405) MF:04.11.08 and ABSINTHE does not recognize it; it says “Sorrty the attached device is not supported.”. Is it compulsory to turn on the WIFI during the Jailbreaking? How do I get the installous icon after I see the Cydia? I just finished jailbreaking my 4S. How to I set it up to use it as a hotspot for wi-fi? i re-downloaded and tried again and I keep running into the same problem..
You need to go into the General menu, and then the Siri tab and turn it on. Or is the siri box coming up but not functioning properly?? I have jailbroken my iPhone 4S on absinthe ios 5.01 etc, and the cydia app is there but it won’t load, It just open a window and then fades back to the home screen…? What exactly am I suppose to do if Absinthe isnt jailbreaking my phone? Like I plug it in and I click “jailbreak” then it says “connecting to ….” and then it says it cant jailbreak my iPhone. I restored and backed up my iPhone, I even re-downloaded Absinthe.What should I do? I thought the 3GS was being supported by Ansinthe…what happened?? does it REALLY restore your iphone??? My iPhone 4 with iOS 5.0.1 is configured to connect to my company exchange server and use Active Sync. One of the items they pushed is that I cannot disable the password feature. It says I need to do that in order to Jailbreak it, right? so, I wonder if I remove “Exchange” as one of my mail accounts, will those settings go away? After jailbreaking, I can re-add the Exchange server, and then I can control what policy they push. But how can I get this disabled? I could wipe the device I suppose… but eh..
Will this jailbreak remove all the data (apps,contacts,songs etc. ) from my iPhone? Does it work on Windows XP? Please reply. Thank you. I downloaded and did all the steps. It eeps telling my iphone 4 is not supported to even start the jailbreak. I have done all those steps and when I plug in my iphone 4s nothing happens. It seems it doesn’t recognise my device. Is there any suggestions? When I connect my iphone 4s the gray jailbreak button dose not change and it kicks it back saying that my device is not supported… I do not know what to do. I have researched different troubleshooting tips and none of them are working. Please help me!! Mine has the same problem, what should I do?? Someone Help??? do you know what to do ? sameee….. have you found any solution? Has anyone figured out how to add back Microsoft Exchange mobil email after jailbreaking the iphone? did you get any help with the question, mine does the same thing? The process seemed to work fine except that I do not have the Cydia app. wen i do restore,cydia goes missing.can something be done?